I think if all the reports are true, that our troubles have not commenced yet. It is reported that we have got the Small Pox in Camp, Three men were taken from the 126 Regt (And that lays right by us) to the Hospital, that had got it. if this is so, I pity the boys, one thing is certain [I] shall not be afraid of it, And if the boys in our Co got it, I can nurse them, but you may be sure I do not like it well enough to nurse any one else. I think we shall get one months pay this week this I know, And the Orderly told me that he thought we would go home then. 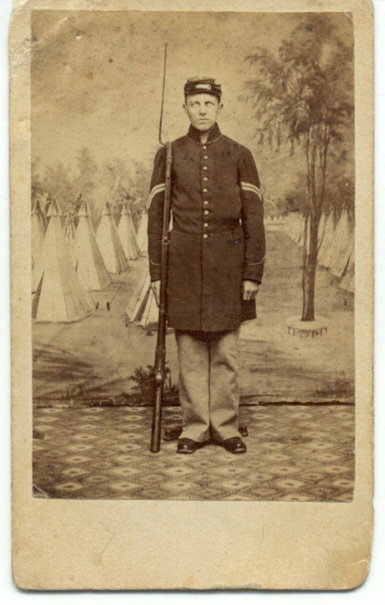 Our Ajutant [sic] told the boys yesterday, that there was no use in the Boys Cleaning up the Barracks, as we were going to New York. Things look now as if we were about the move somewhere, And the most likely place for us to go is to our own State. One thing is certain, if the Small Pox break out in Camp & spreads much A great many of the Boys would leave. 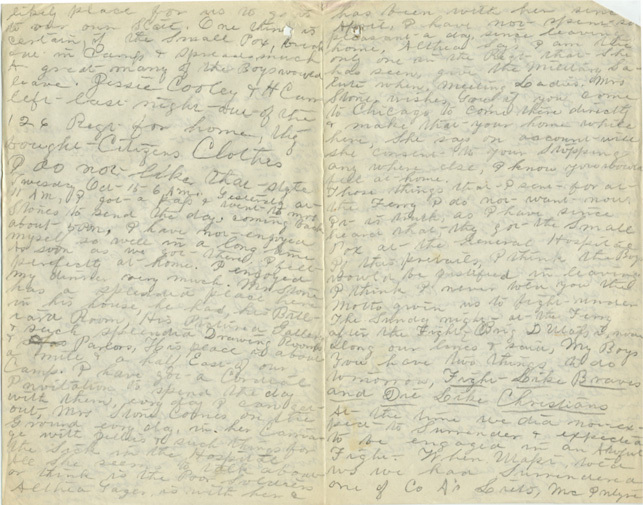 Jessie Cooley & H [Ca ] left last night out of the 126 Regt for home, they bought Citizens Cloths. I do not like that style. Mrs Stone Comes on the Ground every day, in her Carriage with Jellies & such things for the Sick in the Hospital. All She seems to talk about or think is the Poor Soldiers. Althea Yager, is with her & has been with her since April, I have not spent so pleasant a day since leaving home, Althea Say’s I am the only one in the Regt that She has seen, give the Military Salute when meeting Ladies. Mrs Stone wishes You if you come to Chicago to come there directly & make that your home while here, She says on (no) account will she consent to your Stopping any where else, I know you would feel at home. Those things that I sent for at the Ferry I do not want now. It is truth, as I have since heard that they got the Small Pox at the General Hospital. if this prevails, I think the Boys would be justified in leaving. I think I never told you the Motto given us to fight under. The Sunday night at the Ferry after the Fight, Brig D Utassi (D’Utassi), rode along our lines & said, My Boys You have two things to do tomorrow, Fight Like Braves and Die Like Christians. Everything is quieting off Lately, if there is any such thing as our being paid off and discharged from the US Service I will Telegraph, Yesterday morning the Chicago Tribune said the latest Advices from Washington are that the Paroled Prisoners are to be soon Exchanged or Discharged into the State Service. Your site is awesome. I teach 8th grade history and this site helps to bring the people of the time period to life! 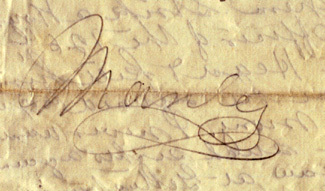 I have been wondering about the spelling of Manley…the signature often looks like Manly w/o the “e.” Do you know for sure what the correct spelling is? I’m confident that his name has the “e”. The adjutant general’s records show it with an “e”, and also the three letters form others wrote it as “Manley”. His own writing and spelling was idiosycratic, or maybe typical of his time, which made these letters very difficult for me to transcribe at the beginning. There are other instances in the letters where he did not use the “e” in common words ending in “ey”. There are several other instances of similar misspellings or shortenings which may have been common in that time. I just checked back and was partly incorrect. 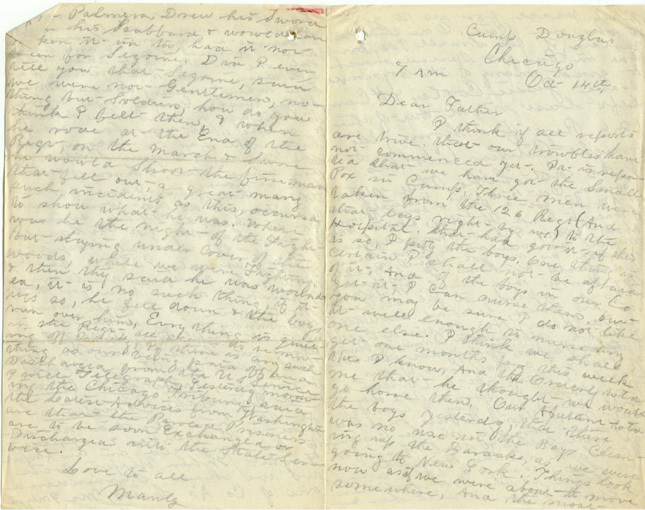 In the letters from Althea Yaeger and L.M. Stout, they also seem also to write it as “Manly” without the “e”. When I have time, I’ll find the higher resolution scans and look more closely. I’m still going with the “e” though.